Some of the most rewarding design work we get involved in involves charities. To be able to contribute and see the difference good design can make to their fundraising activities goes beyond the sense of fulfilment we usually feel upon completion of a project and makes it genuinely meaningful. Over the years we have worked on many print and web design projects for charities. Some particular favourites are highlighted below. 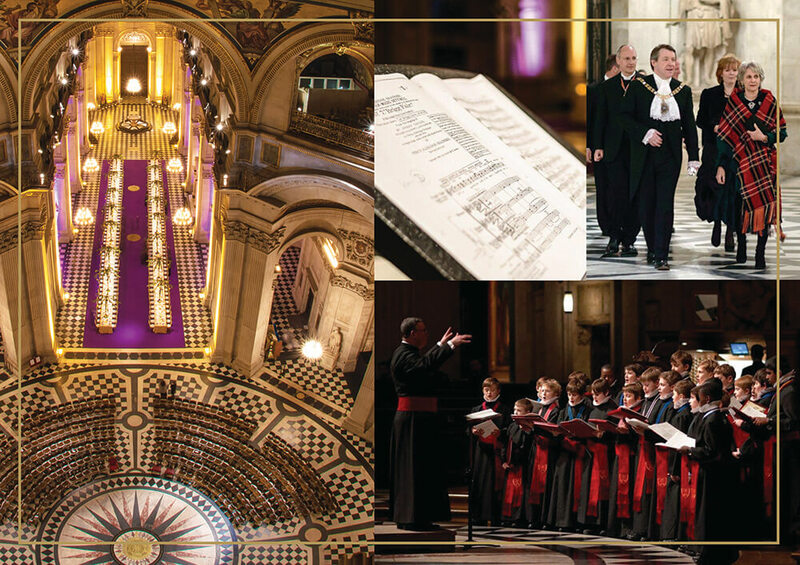 St Paul’s Cathedral Chorister Trust commissioned us to work on an overall look and feel for a major event to be held at the Cathedral raising funds to help endow the future of the choirboys. Though our initial brief was fairly simple, it expanded as the date of the event drew closer. Reflecting on the huge range of collateral we designed for the event for the event it seems a huge undertaking! Starting with the overall creative concept, this was agreed and then expanded to an invitation, then admittance card, placement card and event programme. 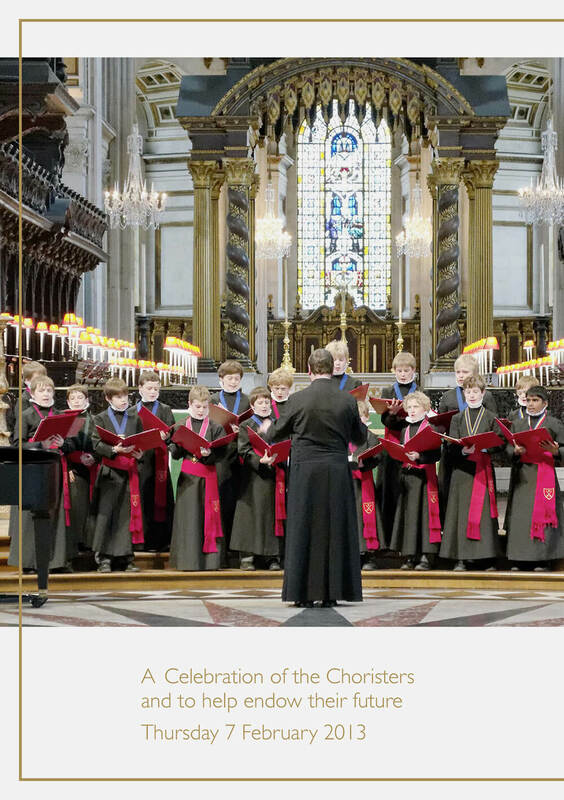 The event was spectacular, and the first of its kind – where the dinner and concert itself was held in the nave of the Cathedral and attended by HRH the Duchess of Gloucester, Patron of the Friends of St Paul’s. Our work for the Trust has also included many other pieces of work over the years, but the most recent has been this advertising campaign to raise funds which has appeared in various publications. The usual way in which this sort of work runs is that a central concept is created and agreed (usually for the year) and then it is iterated across different publications and platforms. The cost base is comparatively low and it’s a good example of an effective charities print and web design project. 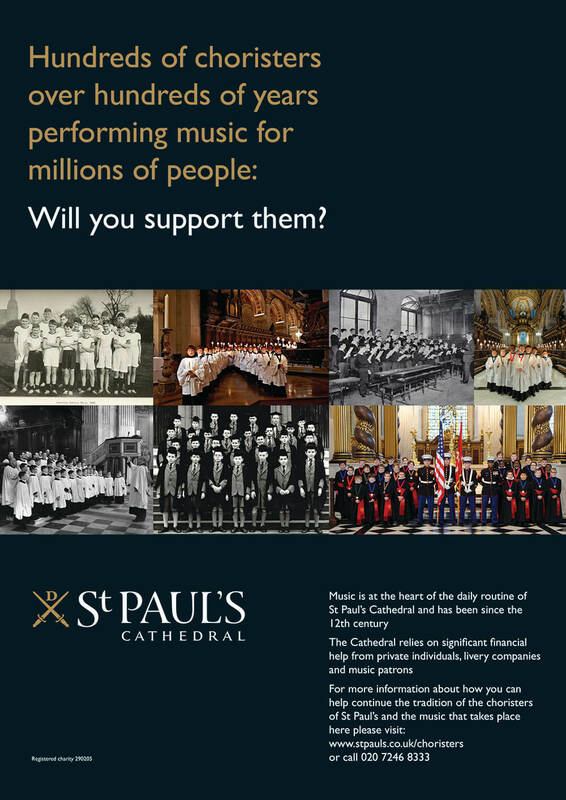 ‘Richard really understands St Paul’s and our celebrated but costly musical endeavours within the Cathedral as if it is in his blood. The MS Society invited us to compete in a tender process to produce a practical guide for hospitals, residential and nursing homes to Multiple Sclerosis, its symptoms and treatments. Our successful bid led us to design and deliver this guide, and we continue to provide occasional updates to the artwork. The guide is based on the MS Society’s brand guidelines, yet as part of our work we create a distinctive look with a bold geometric front cover meaning that a professional in a hurry could find it easily on a bookshelf. This design was then carried through into the rest of the guide. 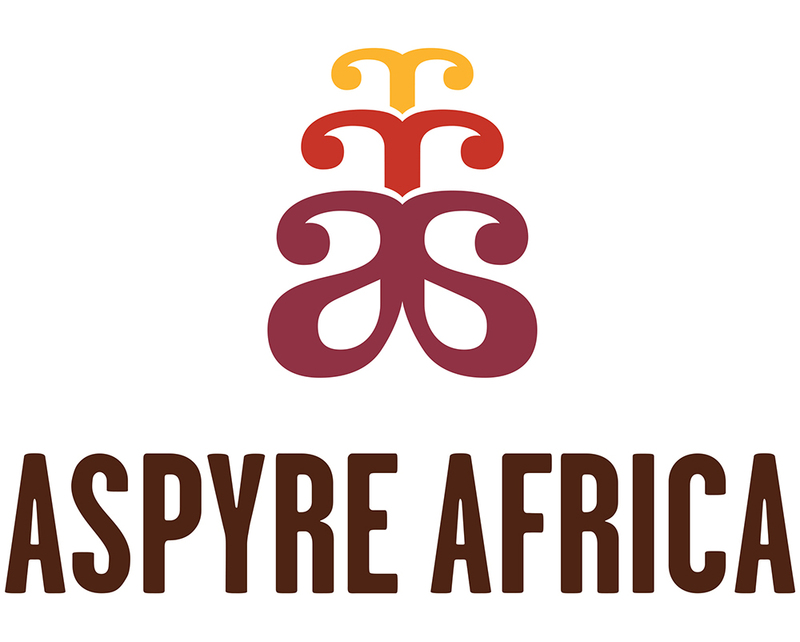 We were approached by the founding team behind Aspyre Africa, a newly-launched charity providing young people in Senegal with access to vocational training very much attuned to the local labour market. Our initial project was to design a new logo and a key part of the brief was to keep an ‘aya’ fern – a hardy plant that can grow in difficult places – central to the design. We ended up drawing a bespoke piece of type around this with a distinctive ‘double-A’ device at its core. 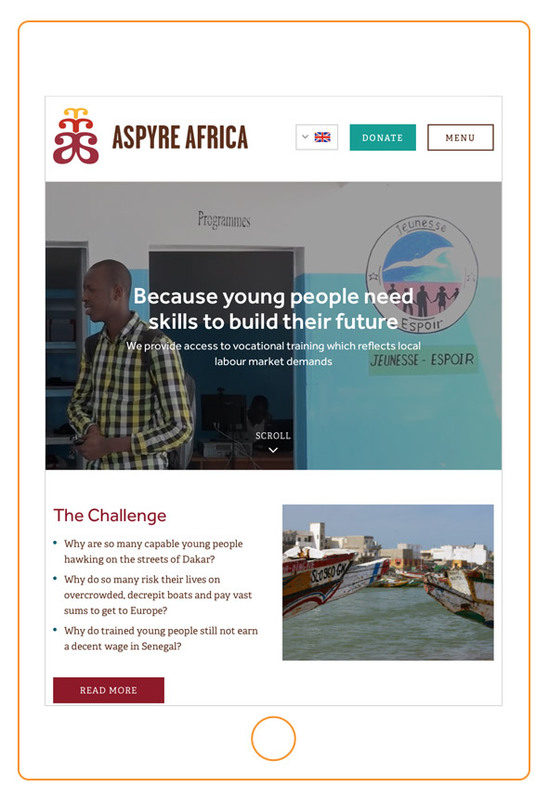 Our second part of this charities print and web design project for Aspyre Africa was a site with fundraising capabilities. This site opens with a short film which the team shot in Senegal and we edited a twenty-second clip to engage visitors from the start. It’s an bold but visually stunning idea for a project which is in itself fairly simple and information-based. Our finished site is fully responsive, works in French and English with a ‘language switcher’ and uses two kinds of PayPal donate functions. ‘Working with Richard and his team has been a joy, both in terms of communication and efficiency, but it is the quality of their designs and their sense of aesthetics that reminds us daily that we could not have made a better choice. 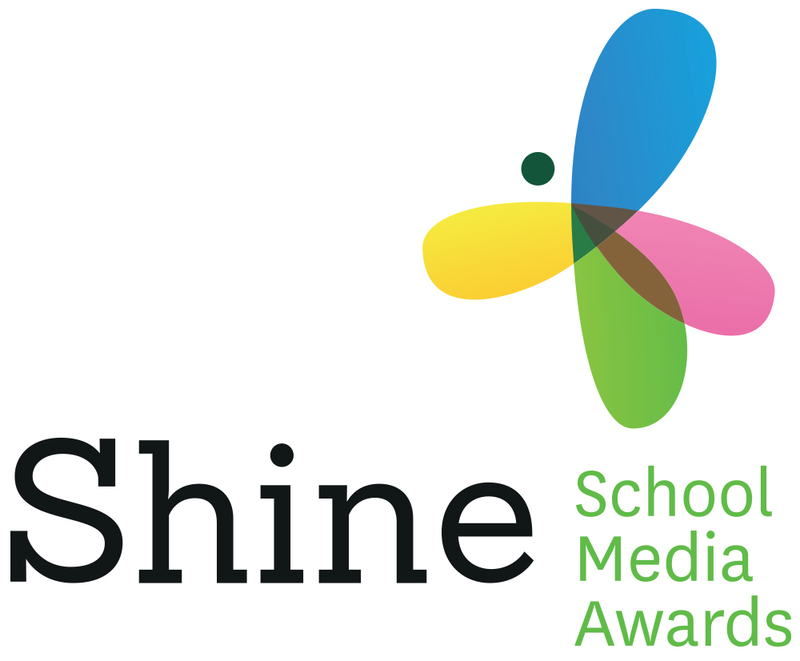 We’ve been working with the Shine School Media Awards for the past five years, gradually building our work over this time. We began by re-imagining the logo of the awards, inspired by the original and being influenced by more than a hint of iconic Spanish artist Joan Miró. This new identity has been widely used by Shine since its conception, particularly throughout the year on increasingly sophisticated fundraising materials. Then, each summer, the branding comes into its own, particular apple to the book that attendees are given just after the conclusion of the annual awards at Stationers’ Hall in central London. This longf0rm piece of print contains the winners’ work, assorted photography, sponsors’ advertising and a background to the judging process. Each year we’ve worked on Shine we’ve approached it afresh – and that has included every aspect of their key touchpoint. In particular we have re-worked their website to include a wide range of information. This included the previous years winners’ work, all manner of information for the young people working on winning in the future including details about copyright, ideas to improve entries and guidelines to follow. All charities have one eye on the future, so a call for entries for the next year is central to the site. We found that many teachers and potential entrants didn’t really know what sort of event Shine was going to be, and what happened on the awards day so we shot a series of pieces of video footage on the day and combined that with stills photography to create a short film which is now on the website homepage. It’s our great hope that we can continue to work with the charities mentioned above, as well as welcoming new organisations to improve the effectiveness of their fundraising materials.